In Western society, we don’t reach social maturity until at least age 18, while children in Ender’s world are expected to act and perform as adults at a much younger age. Do societies in the real world exist where a child enters adulthood at a young age? What effect does that have on the society as a whole? In Western society, we tend to think of anyone younger than 18 as a child (and sometimes, those well OVER the age of 18). But if we look to more traditional cultures and even our own history, we can see that 18 is a relatively advanced age to take on the responsibilities of adulthood. Religious ceremonies such as bar mitzvahs, bat mitzvahs, and confirmations are symbols of the child’s acceptance as an adult in the church and are conducted earlier in adolescence. Other cultures have rituals that mark the transition as well. Today, we wouldn’t dream of expecting a child to save the world, whether he knows he bears that responsibility or thinks he’s just playing games, like Ender. But there was a point in our past where we did. Young boys (and girls- think Joan of Arc) went to war alongside seasoned veterans and were expected to pull their own weight. While that is clearly not the way to treat children in our society, perhaps remembering what children have accomplished can remind us what they are capable of. I finally went to see Ender’s Game, the movie, directed by Gavin Hood and starring Asa Butterfield as Ender Wiggin. The movie was pretty good and the special effects were great. I think the portrayal of the battle room was even better than my own imagination (!) but the psychological aspect of the story was a little bit underdeveloped. Maybe it was due to the constraints of fitting it into 140 minutes and I certainly don’t envy THAT job. But the complexities of Ender’s psyche and the effect that the war has on him are such crucial parts of the plot in the book that I expected them to play some role in the movie. Alas, the finer points of psychological burdens were replaced by lasers and zero-gravity flying sequences. I guess if it had to be cut, at least it was replaced by something pretty cool. – Compare and contrast the Wiggin children. What attributes do they each possess that are necessary for the world that they live in? – Is Colonel Graff a good character or a bad character? Does he exploit Ender or make the hard decisions that are necessary for the survival of Earth? – What moral lessons does Card include in Ender’s Game? Are any particularly applicable to today’s problems? 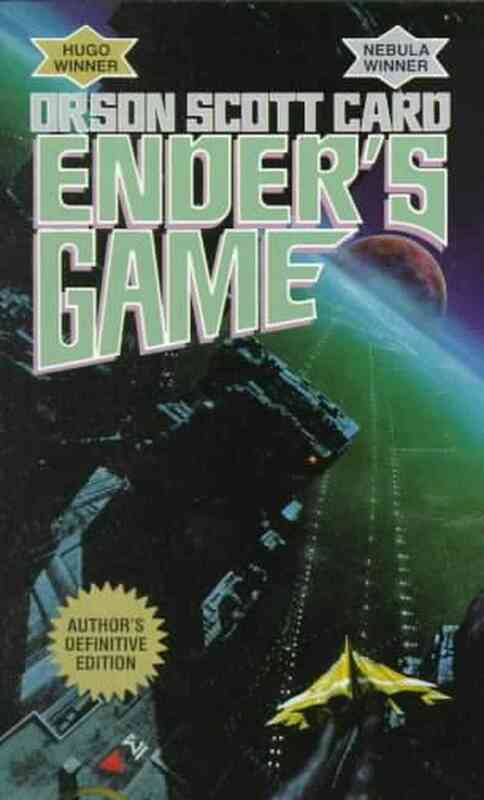 – How does today’s world differ from the one that first read Ender’s Game in 1985? Are any of the points made with the novel still applicable today? – In Western society, we don’t reach social maturity until at least age 18, while children in Ender’s world are expected to act and perform as adults at a much younger age. Do societies in the real world exist where a child enters adulthood at a young age? What effect does that have on the society as a whole? I’ll be addressing the last question in my discussion, now on Monday, November 11th. Check back here to participate or leave a comment regarding any of the discussion questions. Can’t wait to hear what you think about the alternate world that Card has created for our hero to live his remarkable life. I’ll include a brief mention of the film adaptation of Ender’s Game, released last weekend. I haven’t seen it yet but am looking forward to seeing how director Gavin Hood (X-men Origins: Wolverine, Rendition) builds Ender’s world of null gravity. If you’re going to see the movie, PLEASE PLEASE PLEASE read the book first! It’s a quick read and no matter how well done the movie is, it couldn’t possibly hold a candle to the version built in the imaginations of Orson Scott Card and you!